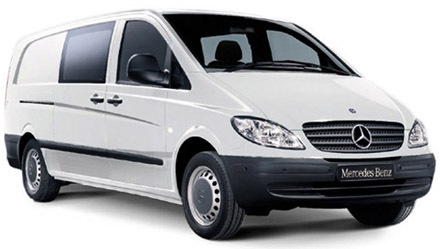 The Mercedes Vito has always been a front runner in panel vans, with their good looks and cutting edge technology. So if you’re looking for a quality van that’s ahead of the game and don’t mind spending a little bit more, the Mercedes Vito could be perfect for you. The Vito makes a bold statement about your business, and you can even choose from three body lengths. When you think about vans, you don’t usually associate them with a great driving experience, but in the Vito you will forget that you are driving a van all together. The Vito is actually the smallest commercial vehicle from Mercedes, however it does offer a load volume of 4.8 cubic metres. You can feel secure with the ABS brakes, driver’s airbag, traction control and all round quality engineering. Depending on your use for the van, you have the option of tailgate or conventional twin doors, which either open to 180 degrees or 270. You may find it useful that there is not just loads of space in the back, but under the front sears too! Inside the cabin, you will find a very pleasant interior design, the refined and classy feel associated with Mercedes is more than evident. With the Mercedes Vito you are not only getting a durable van, but an equivalent to a luxury car too. Everything about the Van has a high quality feel including dials and buttons, the layout is also well thought of providing passengers with a real spacious comfort for both long and short journeys. Got a Mercedes Vito to sell?